We’re working on a schedule of events for the next few months. If you are interested in hosting, check out our FAQ, or fill out our survey. We also added a donations wishlist to our site … check it out if you have kitchen materials to spare, or a hookup with your company. A writer for a national publication contacted us with a few questions about the social dining movement. I thought I’d share our answers here. Q. How did you get started and why? I (Lady Rogue) was living in Lisboa when I met one of the founders of Whisk & Ladle, a successful underground club in New York. She had such energy and passion for the project that I was inspired to start our project when I returned to Atlanta a few years later. Q. How often are your dinners? As a fledging club, our dinners are monthly. Our latest event booked in two hours – with a massively growing wait-list, I might add! – so we hope to expand and offer more events in the future. Q. Is there a particular theme to your club (farm to table, social, pairing, all of the above? ), and how have people responded to it? Our themes are limited only by our imagination – I don’t think anything is out of the question! We partner with an excellent homebrew company, so most of our menus are either paired to a beer or vis-versa. As we grow, we are sourcing more of our ingredients locally. It’s been so unbelievably rewarding to see how people have responded to our project. We have some really smart, passionate people who have become invaluable allies. Our mailing list is at nearly 500 folks … pretty amazing, if you consider we started out with a budget of $100 and lots of coffee six months ago. Q. Also, if you have a favorite dinner or moment since you started doing this, I’d love to hear about it. One of my favorite memories – and yes, I’m kinda tearing up thinking about it – was watching the backyard transformation for our Coconut Island event. Within an hour, volunteers brought over tents, grills, tables, and tiki torches, completely creating a tropical atmosphere. Volunteers helped with every stage of the event – even the unglamorous cleanup – with such good cheer. I kinda want to give them all a giant hug just thinking about it. 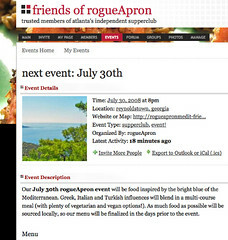 Our July 30th rogueApron event will be food inspired by the bright blue of the Mediterranean. Greek, Italian and Turkish influences will blend in a multi-course meal (with plenty of vegetarian and vegan options!). As much food as possible will be sourced locally, so our menu will be finalized in the days prior to the event. Plan on adana kebabs, pide, moussakka, fresh vegetable salads and some trademark rogue-infused liquors. East Atlanta Brewery is brewing a Pale Ale – sure to remind you of Sierra Nevada’s Pale Ale, but with a freshness only EAB can deliver. Reservations are free – cash donations are accepted at the door. We suggest $20 donations – if you are able to contribute more, we greatly appreciate it! We will contact you to confirm your reservation and to give you the address of the event. Please provide accurate phone, email and snail-mail addresses – you never know how we’ll contact you! Wow! We’ve had nearly 300 new folks join our mailing list thanks to Daily Candy’s coverage! We’re excited about getting to share the rogueApron experience with new folks … but we want to make sure that our events stay true to our mission of good food, good beer, and great people. So, we’ve set up a ‘Friends of rogueApron‘ site for trusted members of our supperclub. If you’ve been to an event in the past, you are welcome to sign up for an account. As a small reward for your continuing support of rogueApron, you’ll get first dibs at making a reservation for new events, plus an inside track on what we’re planning in the future. Thanks again to everyone who has visited our site or been to an event! UPDATE: Please note that your membership will not be approved until you’ve attended an event with us. This is our small way of thanking the people who have supported us. If you’d like to join, come to an event!